“It was wonderful to be in Gandhi’s land,” wrote the Reverend Martin Luther King Jr., a few months after returning from a monthlong visit to India in 1959. King says in his autobiography that “Gandhi was the guiding light of our technique of nonviolent social change” during the Montgomery, Alabama, bus boycott in 1956 that ended segregation on that city’s buses, and throughout the years King led the American civil rights movement. King wanted to see for himself the results of Gandhi’s nonviolent campaign to end British colonial rule and improve the lives of India’s “untouchables” (members of the lowest social caste). 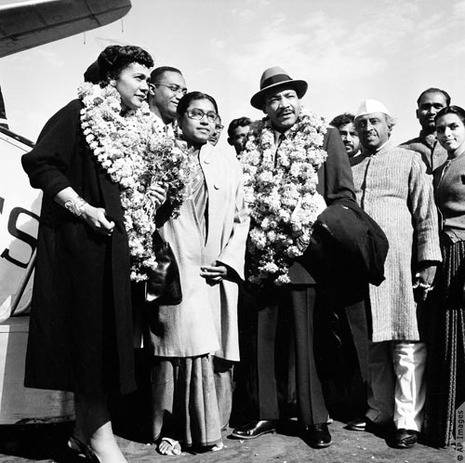 Invited by Indian Prime Minister Jawaharlal Nehru, King, along with his wife, Coretta, and biographer Lawrence Reddick, arrived in Bombay (now Mumbai) on February 9, 1959, and traveled to New Delhi and several other cities over the next four weeks. The American Friends Service Committee (or Quakers, a pacifist Christian denomination) co-sponsored the trip, along with the Gandhi National Memorial Fund. James E. Bristol, director of the Quaker Centre in New Delhi, acted as guide throughout the journey. The Indian government did not host the visit, but Nehru sent a welcoming note and had dinner with King on his second night in India. The prime minister had scheduled a dinner for the Kings the night before. But because of the delayed landing (due to fog! ), in an amazing move that must have sent the protocol-checkers into a tizzy, the prime minister had them for dinner the next night. So February 10 was spent in greetings, garlanding and interactions with reporters to whom King commented, “To other countries I may go as a tourist, but to India I come as a pilgrim.” From the accounts we have, the evening dinner was a fascinating four hours, as King and Nehru had fundamental differences on important issues of their day, which humanity is still disagreeing over today.